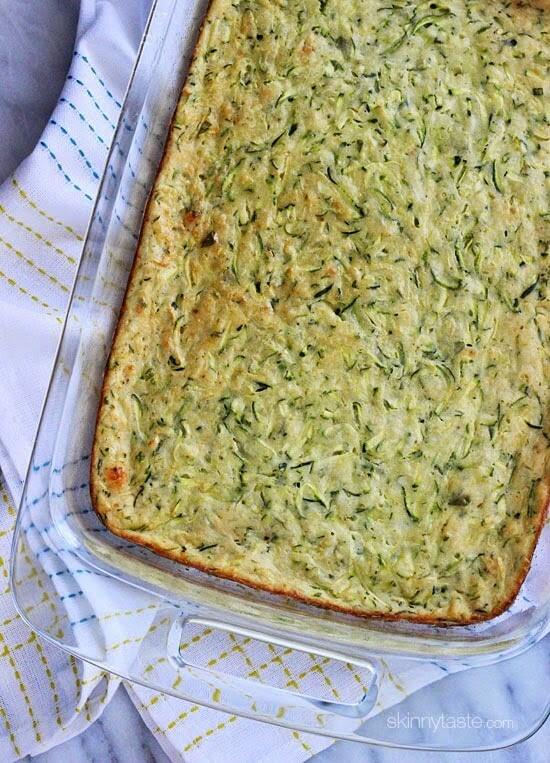 A great recipe for zucchini lovers – this casserole makes a great side dish. I am always looking for great recipes for zucchini since I have so many in my garden! This recipe was first published in 2008 but had some minor issues with the center not cooking through, so I retested this and now it comes out perfect. Spray 9 x 13-inch baking dish with cooking spray and pour mixture. Bake until golden brown and a toothpick inserted in the center comes out clean, approximately 45 to 50 minutes. I’ve made this several times and will make it tonight as a side to Grilled Salmon. I love this recipe so much……..sometimes I crave it. Thank you, as always, Gina! Do you think Kodiak protein mix would be ok to substitute in place of bisquick? 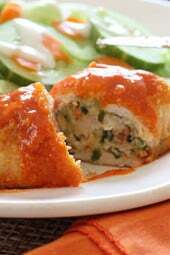 I have made this and love your recipe,. This recipe is delicious! Thank you. That’s awesome Michele! Thank you! My guess is that people who said it was mushy did not get enough water out of the zucchini. I put it in a tea towel and just kept squeezing the liquid out, then lined a bowl with paper towels and let it sit in the fridge overnight, and the paper towels were still wet. If you make sure the zucchini is dry, it bakes nicely. Made it today and was yummy! Saw someone suggested making in muffin tins-temperature and time to bake? Going to freeze some for later-reheating info? Love your website and cookbooks!! Made this last night and it was gorgeous, especially with the hearty salad! Soft and cakey (totally a word), it was bursting with flavour. Can’t wait for the leftovers for lunch now! I’d like to try this recipe, however, I must eat gluten free (celiac). Any suggestions on a gf substitution for the bisquick? Any suggestions for replacing Bisquick? Would garbanzo bean flour do the trick? or corn starch? This looks like the same recipe I use for zucchini pancakes, not sure because I don’t measure but same ingredients. Love the idea of making them into a time saving casserole instead of cooking all those little pancakes because my family loves them and I make them often. I’m wondering if I did something wrong. Mine came out really flat, like a pancake. It stuck despite me spraying the pan, too. On the plus side, it was very tasty, I just thought it would have risen a little with the bisquik. To substitute the bisquick do I just use 1 cup whole wheat flour, 1 tsp baking powder as I comment said and then add?? any baking powder, salt or butter/oil needed? Google would have answered that question for you! Great recipe! I made it last night and my family loved it. I did not make any substitutions and it baked beautifully. I will definitely make this again! Just made this tonight with oat flour instead of Bisquick (put 1.25 cups rolled oats in my blender) and I added 300 grams of chicken. Really good! Thank you for the simple zucchini recipe! How do you get 3 PP for this? I entered all the nutritional information in the WW calculator and got 2 PP. I then went into the recipe builder and entered all the ingredients and still got 2 PP per serving. Can't wait to try! How would you reheat the leftovers after storing in the fridge? Usually recipes calling for Bisquick just call for the dry powder. Do I add 1 1/4 cups dry Bisquick or should I be adding liquid to the Bisquick? how do you shred the zucchini? or can you buy pre shredded zucchini? This was amazing! Wow. I baked it in a 9×9 casserole pan and just baked for an additional 9 minutes. I think it came out fine, though next time I'd probably just use a bigger pan. I had some zucchini to use up and found this recipe. So easy to make. The directions recommended a 13 X 9 pan so it came out as a thin layer. I think the next time I would use a smaller pan for thicker slices. 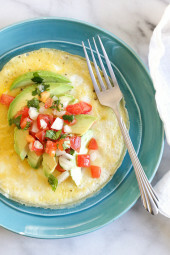 Great for breakfast, lunch, or dinner. Absolutely delicious!!! can you assemble this one day in advance? Do you have an idea of how to make it gluten free? This was so delish! I love the texture – like a fluffy quiche! I can't wait to make this again, and I can see how it would be easy to add different flavors … We reheated it for leftovers and it held it's light texture beautifully. It was moist, but we had no difficulty with it being too watery … we used 3 of the small zucchinis; maybe larger ones hold more water …? I also didn't press the zucchini as I grated it to get more into the cup. Maybe folks pressed it down and thereby used more …? Could I add chicken to this to make it a complete meal its itself? If so, how would the cooking time change, if at all? Thanks! From Kentucky Cook…I prepared the recipe to the "T". Baked at 350 for 45 min. as recommended. It was still a little mushy/soft in the center. Returned it to the oven at 315 degrees for another 17 minutes. It was perfect and it was yummy. Thanks for the help. Anxious to explore more of your recipes! I'm going to try this over the weekend. Reading comments about the moisture in the zucchini, I'm thinking of tossing the zucchini with some of the salt called for in the recipe and let it sit in in a colander for a bit to see if that will draw out some of the water. I cannot WAIT to make this! Trying it tonight! Thank you for this recipe. This has to be one of my favorite zucchini recipes! It was amazing!!!! This is awesome with a little cooked chicken in it. My husband actually requests the dish, which I call zucchini pie (got a little ring to it). I have also added a little bit of Montreal Steak Seasoning. Sooooooooo Good. With chicken in it, it's like a whole meal! Great idea. I used "herbes en provence" and really old parmesan grated up in it. Delicious! Thanks for this recipe! I found your site by accident this morning and then I came across this recipe. 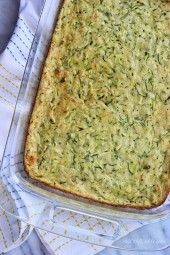 Since I've had a lot of zucchini left, I decided to try this casserole and it was delish! It was a bit moist in the middle, I suspect because I didn't add enough flour or it was too much oil. But it was still very good. I served it with yoghurt salsa and I am thinking of putting it on a weekly menu. Another great recipe! 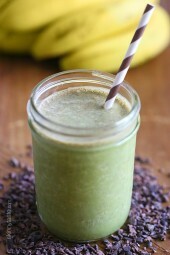 I substituted unsweetened applesauce for the olive oil and you can't even tell! tried it with egg plant , the kids loved it !! I loved it, my husband liked it and my 4yo hated it! and he eats everything, lol.. oh well, I will make again with different vegetables for hubby & me, thanks for the recipe! I know I'm a few years late to the party. The cup of bisquick. Am I turning it into batter (with water) or just pouring the cup of powder into the mixture. That's what I did, and it's good. I just didn't know if I was supposed to do that first. This is a great and easy recipe! I've made it as instructed here, and tonight I'll be trying it with broccolini. Can this be made in muffin tins, so there are individual portions? I've been on the hunt for a savory sweet potato casserole (none of that brown sugar and marshmallow business). Toying with replacing zucchini with sweet potato in this recipe. Thoughts? I want to make this but want to use Broccoli. Any idea if I should keep the same amount of 4c or something different? Oh, I also did the bisquick substitute mentioned earlier but used whole wheat flour. This really needs pepper. Also, we put in some leftover ground turkey breast (99% lean) and it upped the protein in the dish without adding a lot of fat. What are the freezer direction? Do you freeze before or after baking? How how long to cook/reheat after frozen? Made this last night and even my son, who "hates zucchini" loved this! Definitely use the 9 x 11 or 9 x 13 pan as Gina directs. I baked at 350 for 45 minutes and it was golden and perfect. YUMMMM! Thanks, Gina! I would be interested in nutrional values when folks adjust the oil and or bisquik amounts. Has anyone tried this with a metal pan? I made this today. I kept having to keep it in the oven longer because it was really mushy. I wasn't quite sure what went wrong. I did try it though and it was as delicious as it could be for only being 3 weight watchers points. I guess you can add sharp cheddar cheese and up the points than it would be much better. Thanks for the recipe, I love this website! I made this last night and it was wonderful. I used the Bisquick substitute, found in earlier comments and it worked perfectly! What a tasty side dish this was. Thank you, I have used many of your receipes and have not been disappointed with a single one! YUM!!! Just made this in my perfect brownie pan – 18 servings. Came out great, thank you. Do you have to grate the onion and zucchini or can you just chop it fine? So that's 3 whites AND a whole egg? How many whole eggs could I use? I made this today. I used I cup of whole wheat flour with 1 tsp of baking powder (bisquik substitute) and it was delicious! I couldnt even wait for it to cool. Is it normal for it to shrink down? It was about 1/2" thick as it started to cool. Still good though, thanks! if you put in the baking soda and baking powder it should have fluffed up nicely. I used whole wheat flour too, and mine turned out great. I made this today, but did 2 cups zucchini, 2 cups yellow squash. Instead of the bisquick, I used a single package of Jiffy cornbread mix. It was AMAZING!! It reminds me of a corn casserole, but with squash! I'd highly recommend this recipe. How much zucchini did you use? I had the same problem as you with this casserole! I think the key may be to halving the amount of zucchini. Instead of 4 cups try 2. I think that's the key to helping it set as it should. I'm gonna try it again tomorrow…. Made this yesterday and it was fantastic! My husband at 3 pieces! Made this tonight and it was a huge hit. Even my picky son loved it! Adding the Turkey Italian sausage was a great decision and made it filling enough for a main dish. Will definitely make this again!! I also added an extra half cup of the Bisquick mix to make it a tiny bit more substantial.I made mine myself using Brummel and Brown yogurt butter because I don't like using Crisco. Used the 9×13 baking dish which was perfect. Thank you for these recipes! I'm making this tonight for dinner but adding crumbled lean sweet Italian sausage to make it more of a main dish. I'll let you know how it turns out! The picture you posted looks so amazing! I love your site and am so glad I found it! This was horrible! The middle was mushy and that's with adding 20 more mintues. The overall taste was not appealing either. I made my husband through it out cause it made me nausaus. Not sure where I went wrong.